Why is knowledge of Morse Taper parts so important? Taper shank fitted accessories allow fast changes and accurately centered installation of drill chuck arbors and medium and large drill bits. A knowledge of what they are and how they work is important if the user is to be able to use them trouble-free and to be able to order new or replacement parts from suppliers who may not be familiar with them. 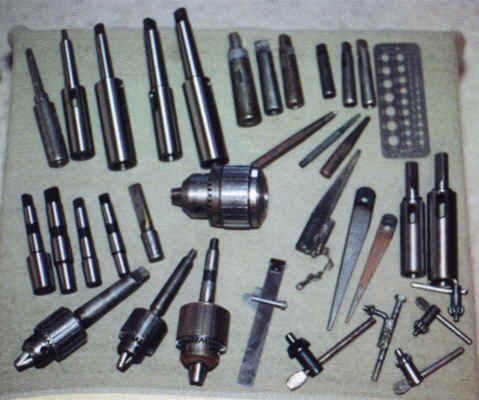 Knowledge the use of Morse Taper on taper shank attachments allows the user to assemble his/her own accessories kit similar to the kit pictured at right. These accessories allow the mechanic to operate the drill press with far more comfort and flexibility in work methods than a simple dress press alone. What is this Morse Taper thing anyway? There are several different types or styles of tapers used on machine tools and Morse taper refers to a taper of 5/8ths of an inch per foot. Drills and lathes use taper shank drill bits and arbors. 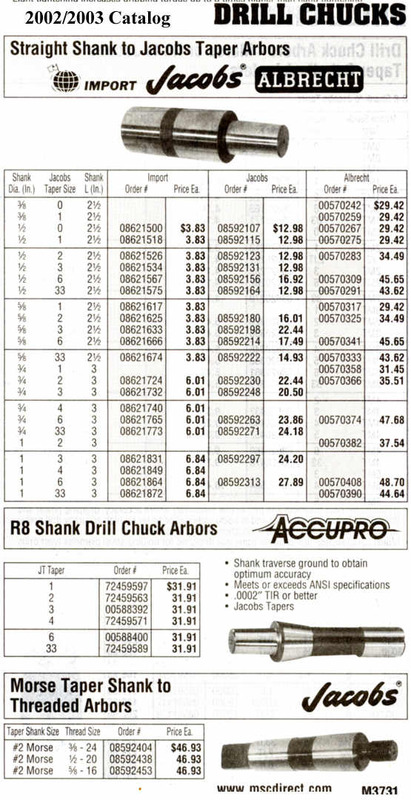 Taper shank drills and accessories come in a series of standard sizes and these are each given a number designation. For example one of the most common sizes of taper used on drill presses found in the home shop is the #2 MT or #2 Morse taper. The next most common size is the #3 MT found on larger drill presses and these are a larger size taper. And of course a #1 MT is smaller than #2, and a #4 is larger than #3 and so on. In the above photo are three drill bits. The smallest bit in this photo is a 5/16ths inch bit with a #1 MT shank, the mid sized bit is a 9/16ths inch bit with a #2 MT shank and the largest is a 1 inch bit with a #3 MT shank. Yet on drill press type parts there is more. Morse taper only describes the taper. 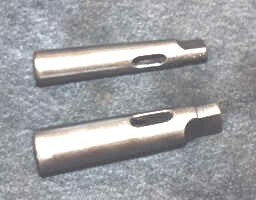 Drill press accessories and MT shank drill bits have a tang machined onto the end of the tapered shank and the edges of the tang fit into a slot machined into the end of the socket they fit into. This slot usually extends all the way through the drill spindle or accessory and through this slot the tang of the MT drill bit or chuck arbor can be seen (photo at right). How do I use a normal drill chuck in a taper shank drill? Drill chucks are supplied with either a threaded hole or tapered hole in the rear of the chuck. The use of Morse taper shank tooling assumes that the drill has a MT socket and of coarse does not mount the chuck directly to the end of the spindle. 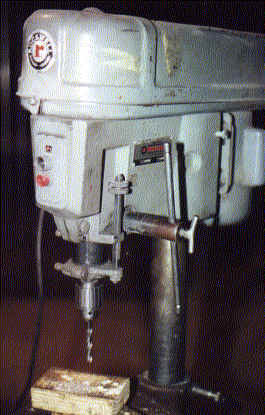 Chucks are mounted to the socket of a drill press by use of an arbor. Arbors come in a wide variety of sizes and types to fit into different sizes and styles of drill chucks. How specifically the chuck is mounted to the arbor- either threaded into a threaded body chuck, or driven into a taper mounted chuck, doesn't matter here. 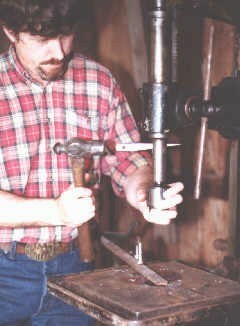 For the purpose of this essay it is assumed that the user already has a chuck mounted to a suitable arbor with an MT taper end to fit the socket of a drill press. 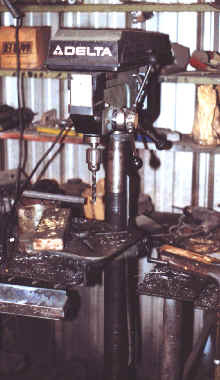 With the chuck mounted to an arbor to match the socket of the drill press, the user is ready to begin working with the drill. 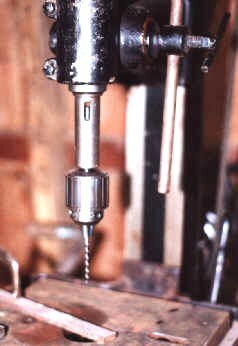 Some drills mount the chuck directly on the drill spindle. Some cheaper drill presses have a JT taper turned on the end of the drill spindle instead of a taper shank socket. 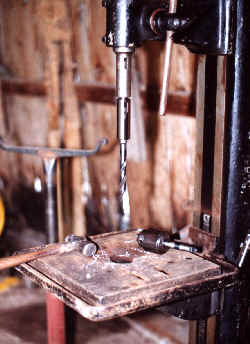 The drill still uses the same chucks as shown in the photos on this page, but the chucks are pressed onto the bottom of the drill spindle. In this case chucks stay permanently mounted to the drill. 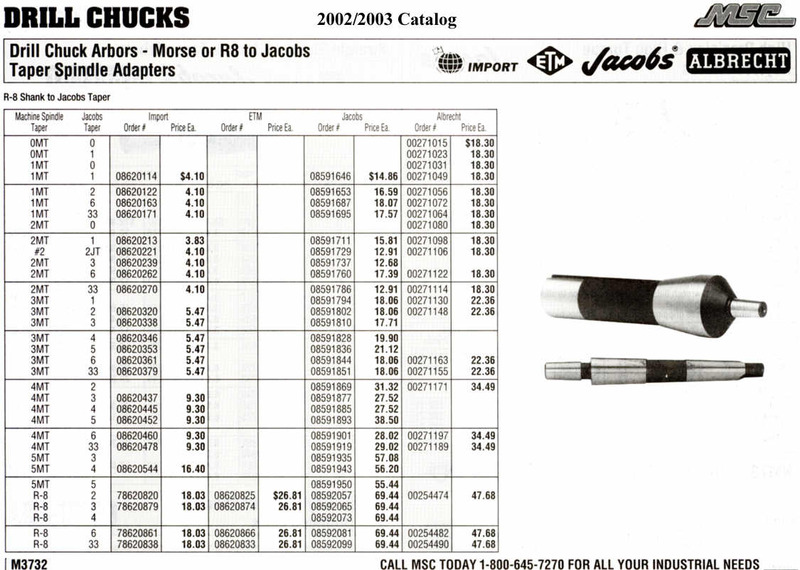 See my Jacobs chuck page to learn more about removal and repair or replacement of spindle mounted chucks. MT tooling cannot be used on these cheaper drills because there is no socket mounted on the bottom of the spindle, and therefore this discussion does not include the permanent spindle mounted chucks. Arbors are available in a large variety of sizes and types. 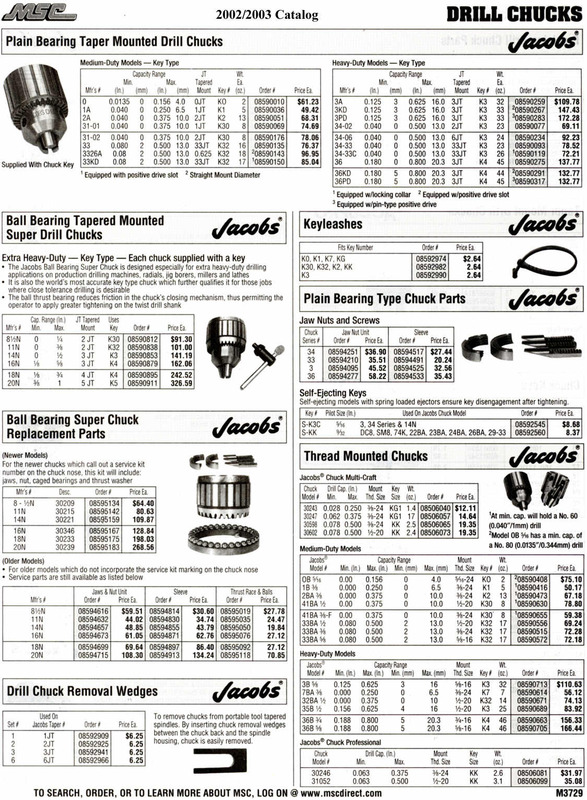 When ordering new parts, the user will need to know exactly which type and taper size is used in his/her chuck- and in the socket of their drill. 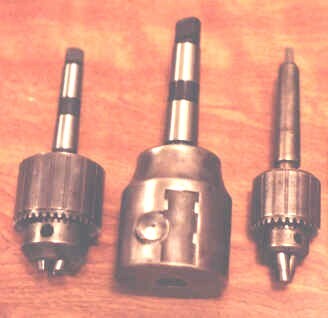 In the photo at right is a group of arbors with JT taper chuck ends of various sizes, and several types and sizes of drill spindle ends. As can be guessed, arbors are ordered by size of drill chuck body taper, and drill press socket size and type. In the photo (near right) viewed from left to right, a 3JT arbor with a 5/8 straight round shank, a 3JT arbor with 3MT shank, a 2JT arbor with 2MT shank, a 33JT arbor with 2MT shank, a 4JT arbor with a 2MT shank. The chuck (photo near right) is a 18N Jacobs ball bearing Super Chuck with a 4JT mount socket. More types of arbors available. This page describes only the styles of arbors used in the author's shop. How are Morse Taper taper-shank drill bits and accessories used? Bits and other taper shank accessories are held in place by friction. They are installed by placing the tapered shank up into the socket by hand, rotating and pushing them into place until the tang can be felt to slide up into the slot machined for it. 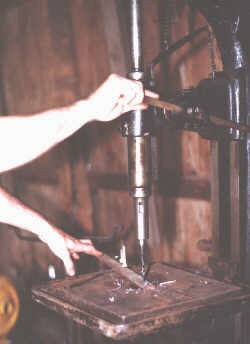 Pressing tightly by hand, enough friction is usually present to allow the user to let go of the tool. A block of wood or piece of metal is placed below the drill bit or chuck and the user then forces the bit or chuck more tightly into the socket by cranking the drill downward into the block with a small amount of force. Photos at right show a Taper shank drill bit being installed in the drill spindle. Another source recommends setting the taper shank tool with a lead or brass hammer. This sets the Taper shank tool in the socket with enough friction that it will not come out unexpectedly. Never hit the tip of a Taper shank tool or drill bit with a machinist hammer because this dulls and damages the part. Removing MT drill bits and arbor mounted chucks. 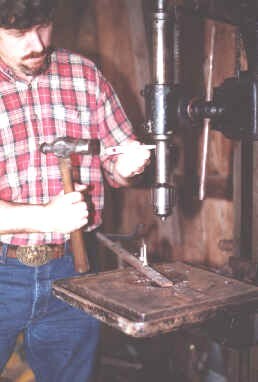 To remove a MT drill bit or accessory, a wedge shaped drift is placed through the tang slot between the end of the tang and rear end of the slot, and struck with a hammer. To prevent damage to the end of the bit, either grip the bit or chuck by hand or place a block of wood under the bit or chuck before removal. A lead hammer helps reduce wear to the drift. Drifts can be bought or made by the user. Here is a selection of photos showing the removal of both a taper shank drill bit and a chuck with a taper shank arbor. Is there some kind of advantage to using taper shank parts? The Morse taper shank allows the user to choose what kind of tool he/she wants to use and to change them in a matter of seconds. Drill chucks for small inexpensive bits and taper shank bits for a wide range of larger sizes where heavy resistance to drilling is encountered. Anyone who has done much drilling knows how aggravating it can be to tighten a drill bit in a chuck as tight as they can, only to have it get stuck in a hole while the drill continues to spin. The Morse taper shank bits overcome this. The tang fitted up into the slot inside the socket will force the drill bit to turn during heavy drilling. The edges of the tang are caught by the slot, and force it to turn under heavy load. This is a very important point. 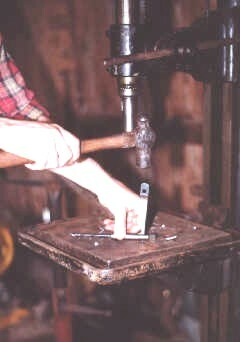 If the edges of the tang are worn or broken off, then only the friction of the taper is being used to turn the bit. The taper quickly and accurately centers the tool in its socket but the tang gives it the gripping power to force it to turn during heavy resistance. So what do I look for if I get my own MT stuff? Corners on the tang must be sharp and straight. Worn or stripped corners will not hold the drill bit securely in the socket. 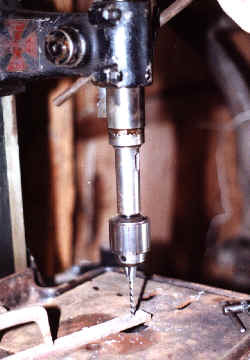 The edges or corners of the taper tang force the drill to turn during heavy drilling. Stripped or worn out corners will allow the drill bit to spin in the socket. Compare the photo on the left with other photos on this page. First thing to look for when selecting a taper shank drill or tool is clean, straight and square corners on the end taper tang. Any modifications or botched repairs would reduce the value of the part. Heating the tang during welding may ruin the heat treatment of the effected area and the repair can be expected to wear and require additional repairs often. In the photo can be seen two #2MT shank tangs with worn or badly repaired edges beside two good tangs. The two taper shank tang ends on the left are new and in excellent working condition. 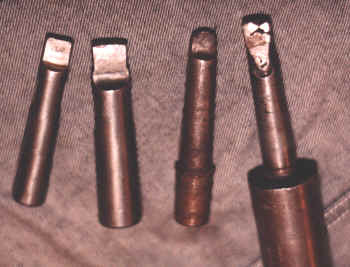 The two taper shank tools on the right have tang end corners that are worn out beyond any further use- and should be discarded. Straightness of the part is also important. Check arbors by rolling the chuck end on a good flat surface and note any wobble of the shank end. These are small and difficult to repair. It is far easier to order new than to repair one of these. Straight drill bits are also important to avoid breaking the drill bit or forcing the work clamps to move and loosen in use. Obvious wear or galling on the sides of the taper shank itself. Wear and galling could make the taper fit inaccurately in the socket and result in a wobble to the part in use. It is possible to remove spawl and other debris from galling by grinding or filing but the overall value of the part is lower. Are all drill presses machined with Morse taper? No, although most good quality drill presses use the taper socket for drill bits and parts, many cheaper presses do not have a taper socket machined into the spindle. Taper shank sockets require extra steps in the manufacturing process and makers of presses often try to leave out these expensive steps to cut costs. Recently a number of cheap new drill presses have been selling at our local tool stores, and these drills have the taper socket and an Asian import Jacobs style chuck with a MT arbor. 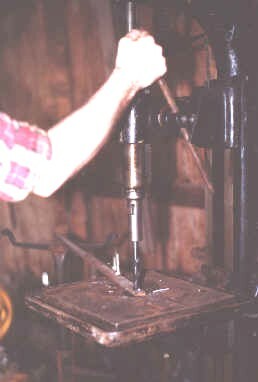 On many modern style drill presses the taper socket is often found machined in such a way that it is retained up inside the quill of the drill. Photos at right show where to find the slot for the socket on this type of spindle. The quill (the barrel part of the drill that goes up and down inside the frame of the drill) has a slot machined in its side, which gives access to the taper wedge slot in the spindle of the drill. To locate this type of socket run the drill quill feed down all the way and look around the quill for a slot similar to the one found in the drill spindle pictures seen below on this page. If you don't see the slot, then the drill does not have a taper socket. It may be necessary to remove or adjust whatever drill guides or special tooling may be mounted around the drill quill to see this. If a slot is found don't yet assume it is equipped for taper shank. One more step to be sure, rotate the drill spindle (grab it and twist) and look inside the slot to see if a taper shank slot in the spindle appears in view as the spindle is rotated around. The back of the tang of the taper shank arbor should be plainly visible at that point. If there is no chuck on the drill then the easiest method of course is to see if the spindle has a JT taper or threaded shaft sticking out the bottom of the spindle. But if the bottom of the spindle is hollow than a quick check to see if there are wedge slots in the spindle, is in order. 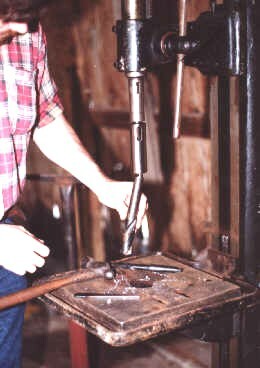 Use of the taper shank tooling in the modern drill is identical to using the older style drill seen in photos below. The difference here is only the need to rotate the drill spindle by hand to line up the slots in the quill and spindle to apply the wedge. What if the drill bits are different sizes or I need longer ones? Sleeves and socket extensions can be used as adapters to fit different sizes of MT parts together and to add length to the drill. An extension is just that- a taper socket barrel and arbor which adds extra length to the drill bit and spindle assembly. See photo at right. A sleeve is used to adapt a smaller MT size bit or accessory to a larger MT socket (for example a drill bit of #1 MT to a socket of #3 MT). A sleeve looks like a hollow taper shank. An example of some sleeves is in the photo at right. A tang slot is machined near the end of the sleeve to allow fitting and removing of taper shanks of bits and accessories. The extension adds length to the drill as the name of the part implies. The extension can also be used as an adapter to fit smaller MT bit sizes to larger sockets, and larger MT shank sizes to smaller sockets. Of course extensions also come in same size MT shank and socket sizes. The hollow end of the extension is machined as a MT socket with a tang slot. Drill bits and accessories are inserted in it just as they are in the socket of a drill spindle. 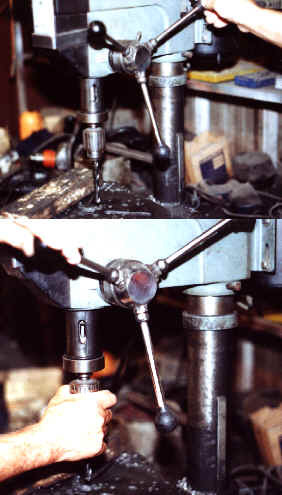 A Morse taper shank is turned on the opposite end and this end is inserted in the taper socket on the drill press. Extensions are available in a large number of sizes with a variety of socket and arbor size choices. When using a bit and sleeve together, the shank of the taper shank bit or accessory is pressed by hand into the sleeve, carefully fitting the tang on the end of the bit shank into the wedge slot or window in the sleeve. The sleeve is then pressed up into the socket of drill. A block is placed below the bit or chuck and the whole assembly is pressed tightly together by forcing them downward into the block with the feed handle on the drill press. The sleeve only allows the user to place a smaller size MT shank into a larger socket. To remove the bit or tool arbor from a sleeve, the sleeve must first be removed from the socket it is mounted into. This is because the tang slot of the sleeve is covered inside of the socket it is fitted to. The spindle is rotated a until wedge can be easily inserted in the wedge slot and tapped with a hammer until it will remain in place on its own. The bit is grabbed to keep it from falling on the floor and getting damaged, and the wedge is then struck with a hammer to knock the taper union apart. 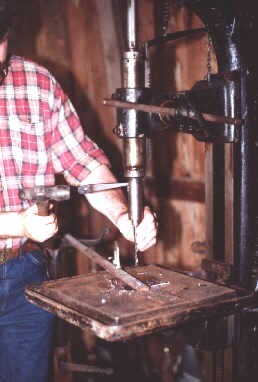 With the sleeve removed, the bit or other tool can be removed from the sleeve by laying the sleeve down over the slot in the drill press table or over the hardie hole of an anvil. A drift is then placed into the wedge slot in the sleeve and struck with a hammer to split the union apart. 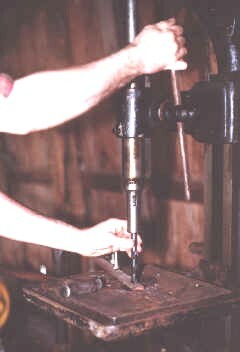 A sleeve adds little or no length to the overall drill in use. It sounds so complicated, I just want to use my drill for simple stuff. This whole essay makes the taper shank drills and accessories look more complicated than they really are. Don't let the size of this writing fool you. Taper shank tools are very simple to use and most anyone can figure out how to use them quickly on their own without ever reading something like this. The Morse taper feature allows the user to have more control over how they use their drill and gives them the option to choose what parts and tools are used to do the job. These parts are easily found second hand at antique engine shows and swap meets as well as ordering new, and the user can mix and match parts to fit their needs. 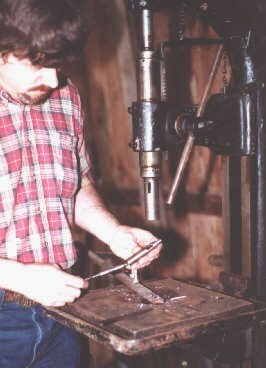 Antique presses use them as well as modern drills so MT tools are interchangeable from one machine to another. Where can I get new Taper Shank drills and chucks? There are several sources to obtain new chucks and chuck arbors. These are for experts that can determine their own needs. I recommend MSC Industrial and Enco and McMaster-Carr. 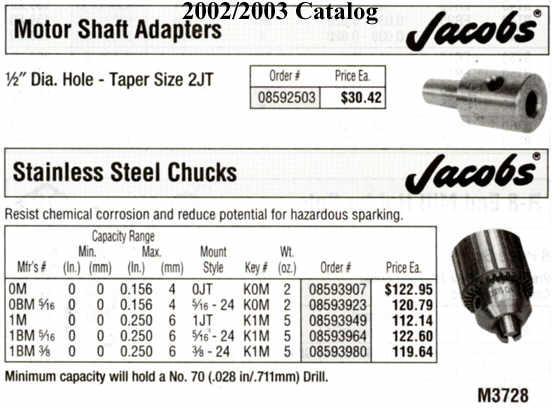 McMaster Carr has a nice chart for helping new buyers understand terminology of the parts of chuck arbors, click on their link to drill chuck arbors sleeves and sockets. 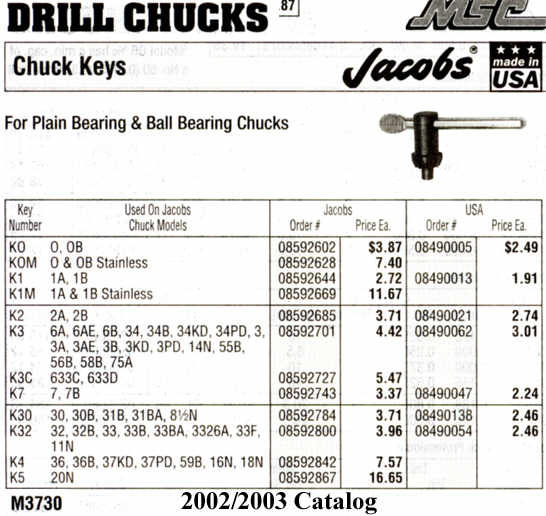 Drill bits, chucks, and arbors can be purchased at MSC and Enco and McMaster-Carr for far less money than a typical big city lumber yard/home store. Enco website: http://www.use-enco.com/ MSC Industrial Supply website: http://www1.mscdirect.com/ McMaster-Carr website: http://www.mcmaster.com/ See the links on my Links page under the heading Machine Shop Tooling & Supplies. Is there a short little book out there I can use when I have questions? The scans at left are from an old MSC Industrial catalog. The pages shown at left show some of the taper shank tools that are available through industrial tool suppliers. Page created July 9th, 2000.